Discussion in 'News & Patches' started by Starzeh, Oct 28, 2018. The Freeville Update Patch is drawing near and includes all new, unique features that we have not had in the past. With this patch we will be updating the server to version 1.13.2, and making the Free world accessible. Below I will be explaining the new features and how they're intended to work, but note that features may be tweaked and finely tuned in the upcoming days. Once you become Free, you can create and join a guild. There is currently no cost to create or join, however you must be in a guild to use land protection blocks. Most of the guild options are presented in a GUI, minimizing the amount of commands you will need to remember. The war option in the guild GUI is currently disabled and more information about this feature will be released in the future. Until then, we will not be answering questions about this feature or the ETA. You will be able to protect your land and the items within it. However, land protection is going to be very limited and comes at a high cost. You also must be in a guild to purchase and use your land protection blocks. More blocks will be added in the future but will also have specific uses. Farming in the Free world will be much different than you are used to. It is now more difficult and risky to grow your precious crops, as they no longer grow in the wild. Instead, you now need to purchase a block called the Illegal Farming Block. The difference between this block and the others is that no blocks inside the Illegal Farming Block are protected. It is simply there to allow your crops to grow. 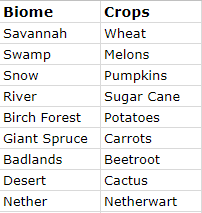 Crops now have specific biomes in which they flourish, and when planted outside of their preferred biome will not grow. Even when planted in the correct biome, your crop has a slight chance to fail on growth percentage. With farms outside of guilds now being unprotected, there is the added risk of other players stealing from your farm. However, anyone who steals crops from another person's farm will receive Infamy Points for each crop broken. note: you WILL return to the main prison and need to work your way back out to Free, including ranking up. The only way to reduce your Infamy points is by going on duty and guarding the Prison population. Once you reach 1800 Infamy Points, however, you will you no longer be able to guard and the only way to reduce your Infamy Points is getting caught and serving your time. We will no longer be taking applications or hiring for the guard position. Guards will solely come from Free players who choose to guard the Prison. Free players will be rewarded money for every contraband item they confiscate, and if they have accumulated Infamy Points, points will be deducted as well. In order to prevent this feature from being abused, we have decided to charge prisoners $50 when they hand over contraband, rewarding the guard $45 for confiscating it. The prisoner will also gain one Infamy Point when the guards Infamy is reduced by one. Please make sure to read this thread thoroughly before asking questions. If after you still have them, feel free to ask me at any time and I will do my best to clarify. Once again, everything in this thread is subject to changes or minor tweaks. We look forward to your feedback and hope you enjoy this update! Pebbles27, rohanguard1, GSU and 12 others like this. Looks like an amazing way to increase focus on post prison gameplay! Excited to try it all out soon! FrostyPenguin and Lax like this. This sounds awesome and truly sounds like it will make the prison vibe still continue after becoming free! Love this crossover between the Free world and the prison. Can't wait! 1 question regarding the hand over of swords what if a C-Blocker does not have the required 50 dollars will it prevent them from dropping? The guard won't get any money. rohanguard1, FrostyPenguin and gkidedabeast like this. FrostyPenguin and gkidedabeast like this. This is dope. Love the concept, keeping the whole sever connected. Also sorta giving players “bounty’s” not related to money. So are guild allies going to be a thing? like before where clans could ally with each other and stuff. How does one switch from being Free and being guard, and vice versa. Join guards: Click the sign at free spawn. NoneOfThat, Stick and Jarhead17 like this. What are the dimensions on the protection stone areas, and do the numbers given include height? As for height, it will go as high as you want. As long as the area the pStone covers is within the block limit. Did you just link him to the thread he's already in? Yes... I did not realize I was in this thread specifically.... Hopefully I was still helpful!